ETSU vs NC State from 1990 inside the Memorial Center. This game against NC State is the second largest crowd to ever attend an East Tennessee State home basketball game, final attendance was 12,240. 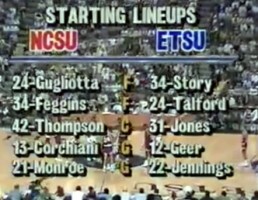 ETSU had just entered the top 25 prior to this game and this NC State team featured all-american’s Tom Gugliotta and Chris Corchiani. NC State’s coach Les Robinson was making a return to ETSU where he had coached at the previous season. It was a hard fought game on both sides and is arguably considered one of the biggest home games in East Tennessee State basketball history. One of my all-time favorite ETSU basketball games. See more ETSU basketball games in the video section. Pingback: ETSU Hoops | Are the Bucs living in the Glory Days Today or in the Past?